When you think of good dub music, old-school artists like King Tubby and Lee “Scratch” Perry may come to mind. Labels such as Trojan Records and Fire & Ice capture that telltale dub sound that is legendary. As the years have progressed, newer artists like Black Uhuru and Dub Syndicate have added their own style, expanding the boundaries of what is “dub” music. Celebrating the millennium, a newer more electronic dub sound has emerged; it combines authentic reggae rhythms, old-school dub sounds and newer electronic beats. This aptly titled style is called: Dubtronica. Instrumental up-tempo beats, classic horn lines, scratchy political lyrics and deep half-time reggae grooves permeate the sound of Luxuryville’s newest release, Dubtronica, Vol. I. There are even a few horn and guitar solos thrown in for style. The music segues seamlessly from double-time electronic beats into half-time old-school reggae riffs and bass lines, and then back again. Every one of the eight tracks brings something new into the dub equation, experimenting in ways perhaps not yet imagined. Above all, the album’s sound is fresh, memorable and turns the wheel another revolution in the dub world. In a landscape full of incredible dub artists and reggae grooves, Luxuryville Records humbly pays homage to the dub genre and adds a little bit of their own spice. We hope that you will join us in the celebration and release of Luxuryville’s long awaited dub album release, Dubtronica, Vol. I. For additional information please contact Devon Kurzweil at (303) 667-1190, or at dkrockstar@aol.com. See more of the album at http://luxuryville.net/. Colorado producer, writer and musician Devon Kurzweil is the driving force behind Luxuryville. A multi-instrumentalist and talented guitarist, Devon creates and performs the majority of the music featured on the new album. Dan Levin (Air Tight Experiment, Fina Dupa) handles the vocals flawlessly, as if reggae was his main gig. Adding even more color, the fine horn section of Soul School were brought in for those classic reggae horn lines. Dubtronica, Vol I., is the long awaited culmination of Devon’s many surf trip musings and music explorations around the globe. 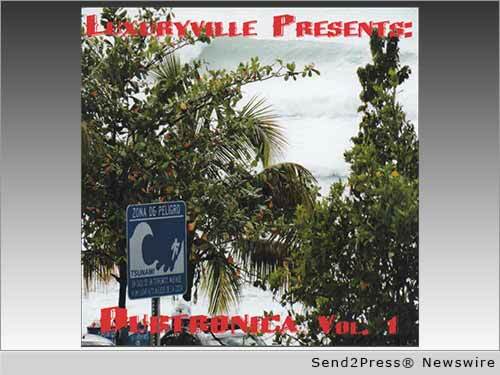 Original Keywords: Devon Kurzweil, Dubtronica Vol 1, dub music, entertainment, CD, electronic dub sound Luxuryville Records Denver Colorado DENVER, Colo.
REFERENCES: African American Interest News, Devon Kurzweil, Dubtronica Vol 1, dub music, entertainment, CD, electronic dub sound Luxuryville Records Denver Colorado DENVER, Colo.